"Volunteerism is the noble commitment to humanity," commented one of the Youth Mediactivists when asked why he volunteered to pack 6000 Water, Sanitation and Hygiene (WASH) packets for UNICEF's WASH program. 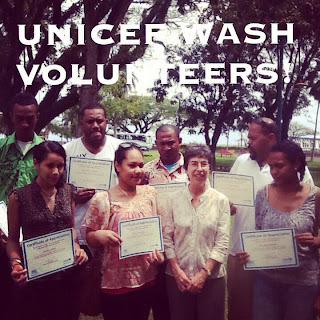 On September 25th 2013, seven Youth Mediactivists were awarded certificates of appreciation on the last day of the three day WASH in Emergencies Training, held at JJ's at the Park, Suva. Ms. Isabelle Austin, Deputy Representative of UNICEF Pacific, along with Marc Overmars, WASH Specialist at UNICEF Pacific, Guy Mbayo, Regional Emergency WASH Specialist from UNICEF Bangkok, and Chander Badloe, Regional WASH Advisor from UNICEF Bangkok presented the certificates and thanked the volunteers for their hard work in packing 6000 pre-positioned WASH emergency packets that would be distributed during emergencies. The ceremony was part of the WASH in Emergencies Training so that both the volunteers and the WASH cluster members could learn from each other. For the youth volunteers, it was a chance to see where their hard work was contributing to. As Jioji Cakacaka pointed out when asked to talk about his volunteer experience as a WASH volunteer, he said that at first he didn't know what he was going to do when he signed up to become a UNICEF WASH Volunteer, but when he realized that these packets were going to be used in emergencies he was really moved. He explained that he is from Nadi and lived through some of the effects of the floods and Cyclone Evan. Mr. Chander also shared a few words about the important role of volunteers in UNICEF. He recalled that his first experience of UNICEF was through student volunteers selling Christmas cards on a cold harsh wintry day - and remarked that knowing that some of the money UNICEF spends on programs comes from the hard work of volunteers makes him ever so conscientious of how and where UNICEF spends its funds. To learn more about UNICEF and the UNICEF Youth Mediactivist program, please explore our website, unicefpacific.org or check us out on facebook!